BOSTON — One foot is on the gas pedal, the other foot is on the other team’s throat. You could say the Cavaliers are standing pretty right now. There are no signs of let-up in their stride, which they’ve hit since the playoffs began. These are not the Cavaliers who ended the season on a bumpy ride. These are the Cavs who, as many suspected, are light years ahead of anyone else in the Eastern Conference, based on an undefeated romp since the first round. They’ll try to make it 10 straight wins Friday after they ambushed the Celtics in Game 1. The bad news is the Cavaliers are indirectly encouraging basketball fans to go run errands until it’s time for the NBA Finals to begin. The good news is LeBron James is putting on a show and keeping his teammates laser focused on the task at hand. This smells like another series sweep, or at worst a very quick one, and LeBron says there will be time to relax once it’s over. Well rested and hardly lacking in motivation, the Cavs are moving right along. They were in danger of losing only the playoff opener to Indiana when CJ Miles missed a game-winner at the buzzer for the Pacers. Otherwise, only a handful went down to the final few minutes. All of the vital signs are vibrant: Good health, no heavy legs, considerable help for LeBron, and of course LeBron demolishing virtually every defender in his path. The Cavs are second to the Warriors in playoff scoring, but leading everyone with 42 percent shooting from deep. There have been spotty times defensively, yet the lineup appears to be in sync, the best it’s been all season. LeBron is fresh from the rest days he took during the season and the days off between series, and it shows; he’s averaging nearly 35 points, nine rebounds and seven assists and doing it efficiently. No team has ever gone through the postseason undefeated, and while the Cavs have competition for that distinction from the Warriors, LeBron appears to be on a legacy mission right now. He’s one game shy of matching Michael Jordan’s record for most consecutive 30-point playoff games, and remains near the top of a handful of other individual playoff records. Also meaningful is how the Cavs, obviously, haven’t lost a postseason game on the road, a streak that started with their Game 5 win during last year’s Finals. “The energy and the mindset is where we needed it to be, starting off on the road in the Eastern Conference finals,” LeBron said. 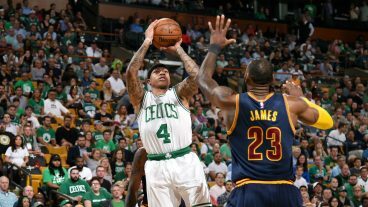 If the Cavs do finish off the Celtics in four, Cleveland will have spent a total of 27 days off between series, including the NBA Finals.